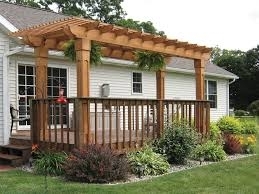 Refresh your deck - Put up a pergola | A.B.E. Remodeling, INC. Beyond the subject of the Robin, that was just posted................On another note if you're thinking about freshening up your home this springtime or summer please feel free to give us a call. Currently we are refreshing homes around the Lehigh Valley area. Some folks are having kitchen updates, and basement makeovers, as well as window replacements, new porch posts and other small to large projects being done. Soon may be the time to ""renew"" your deck or put up a gazebo. We invite you to give us a call to talk about projects that you might be thinking about and that you might need professional help in completing. We'd love to hear from you. In any event, watch for Robins upon your lawn...and enjoy your days.